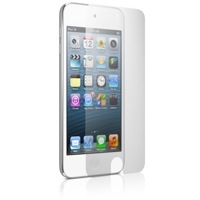 Transparent Acrylic case for iPod - Protect and wear your iPod any way you like. Description: Acclaro - A compact, lightweight and transparent Acrylic clamshell-style (nano) or clip on style (2nd Gen shuffle) protective case. Rugged and stylish, Acclaro lets you show off the beauty of your iPod, while surrounding it with an ice-like layer of hard-shell protection. Acclaro offers great bump, drop and finish protection for iPod's thanks to it's hardened Acrylic composition and generous 1.0 - 2.0mm wall thickness. iPod classic and 5th Gen model includes a neck lanyard and quick-release belt clip - either can be removed. nano model includes removable neck and wrist lanyards. Both feature raised rear slot for securely threading a belt, or the optional armband through. And the iPod shuffle model retains full functionality of the player's built-in clip. Acclaro for 2nd Gen shuffle model includes a practical headphone cable winder with cable lock, which is incredibly useful in practice - no more dangling cable mess, just a neat and clean look - no matter what you're wearing. 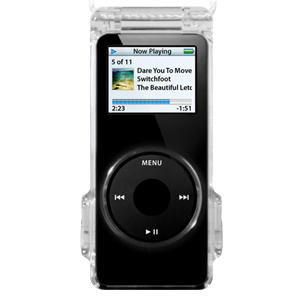 Easy access: The iPod nano model features port for click wheel, and open bottom for headphone and dock connector port access - case must be opened to access hold switch. Both iPod and nano models include removable neck lanyards. nano includes a detachable wrist lanyard; classic & 5th Gen includes a removable quick-release belt clip. Raised slot on rear of both allow attachment of belts, straps & armbands. Acclaro for iPod shuffle features port for accessing controls and unrestricted access and use of the shuffle's built-in clip, and adds the super-useful headphone cable winder and cable clip.